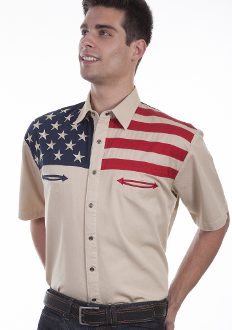 This Scully Mens Antique Stars and Stripes Short Sleeve Flag Shirt is a fashionable way to show your patriotic pride. Mens western flair short sleeve shirt is made of 100% cotton with pearl snaps. ** This shirt is also available for the ladies to match.